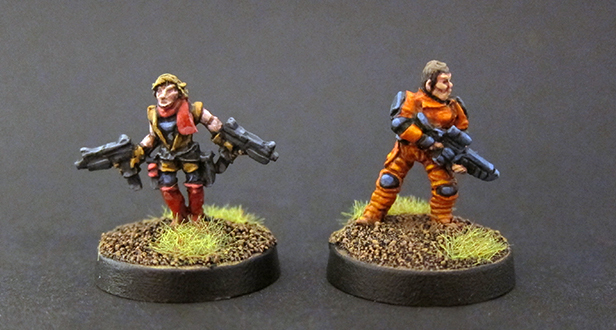 Continuing my Vault Heroes team, are the sister figure from the Khurasan Highway Soldier pack, and a GZG UNSC trooper with a GZG head-swap. For color inspiration I stuck with a kind of Mila Jovavitch vibe for the twin-gun toting lady and a Gordon Freeman feel for the rifleman. This was mostly because I'd already maxxed out on black for this team, and I wanted some color variety that wasn't green. My favorite part of this couple are the fingerless gloves on the rifleman/scientist. It was fun to do a non-military color scheme for one of these minis too. I like the orange armour! What colours did you use for highlights? 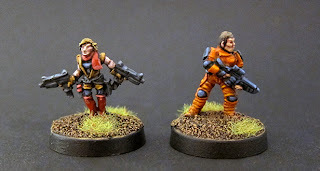 You have become my go to for 15mm inspiration, now that Dropship has changed crews. Props for you on my blog. 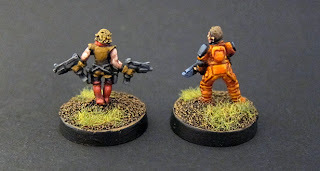 Andy- I used Vallejo orange red, washed with GW ogryn flesh wash, then highlighted with the base color+vallejo flat yellow, then a final glaze of vallejo transparent orange to tie it all down. I'm currently on multiple tangents: 15mm Sci Fi, 15mm Sci-fi interior,15mm Post Apoc, 15mm horror/Cthullu, a 15mm solo RPG (3:16) And I'm very close to slipping into 6mm "travel kit" skirmish! I think the key to being able to handle all this is not collecting "armies" as such, I build warbands at the most. How do you do your faces? The shadowing is very smooth looking. I'm still figuring out faces in 15mm, as the sculpting varies so much. Thats awesome stuff, hadn't thought of that use for the UNSC, good idea. Fantastic looking miniatures, the head swap on the UNSC trooper looks great. Sweet! I have some of the UNSC troopers primed up... i'll have to do some head-swaps tonight! awesome job and extremely nice for such scale. I saved your blog in my faves. love how wisely you used intense and vibrant colors instead of going for the muted down tendency nowadays. ps: no caps were harmed during the writting of this comment. Those are excellent. Love the Milla fig.